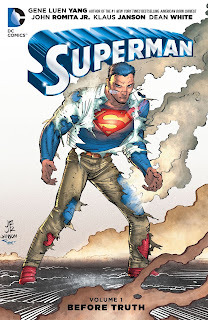 Gene Luen Yang was dealt no easy hand with the story collected in Superman Vol. 1: Before Truth. The writer's first arc connects immediately to the mega-event "Truth," the story involves both Superman and Lois Lane necessarily acting out of character, and we're left with more questions than answers about the villain of the piece. As such, it's hard to fully know what to make of Yang's issues, because it's tough to find what Yang himself is trying to say among the needs of the larger story. Artist John Romita Jr. does nice work here but really starts to shine at the very end with the grittier Superman who emerges, and we intuit that Yang is more comfortable, too; this is where the DC You aesthetic begins to emerge as well. In some respects Before Truth seems a prelude to where this team really wants to go, though at this point they only have six issues left to do so (and only three before the next crossover). Now that Rebirth has taken off and Peter Tomasi and Dan Jurgens have cemented their partnership as the new Superman team, this Superman run becomes, like many DC You series, just something of a footnote as Rebirth steals the spotlight. Before Truth begins with a single issue written and drawn by Romita. Whether you find it funny or not that Batman calls a denuded Superman -- fresh from experimenting with his new "solar flare" power -- "nature boy" and scolds him not to sit on a Bat-plane seat naked will largely determine whether this chapter is for you. Romita is way off with his laugh-riot Batman throughout the piece and also a Flash that reads like Wally West from the Justice League cartoon, letting alone his rather silly hungover Superman, though assuredly this issue has an important moment leading in to Yang's story. It's from that dubious start that we have Before Truth, which requires that Superman conduct dangerous experiments with his powers even though they leave him weakened, then be careless enough in his weakened state to essentially reveal his secret identity, and then allow himself to be blackmailed to keep his identity from being revealed. I'm reminded of when Scott Lobdell had Clark Kent spying on Lois's text messages; I don't mind a Superman who's young in the New 52 aesthetic and who sometimes makes bad decisions, but there's an almost unbelievable series of bad decisions here stemming from an uneven start, and that makes the whole thing seem a little sideways. "Exposed," the story from the Free Comic Book Day Divergence issue that was actually published prior to the "Before Truth" issues, is shunted to the end of this book where it fits chronologically. In some respects it's the strongest sequence of the book, with a hoodie-clad Clark, his identity revealed to the world, trying to have breakfast with Jimmy Olsen until a super-powered criminal with an axe to grind interrupts. Clark is unshaven, put-upon, and angry here, and Romita depicts him much better than he does a flying Superman in his busy costume; equally Yang writes a droll bit of banter between Clark and Jimmy. Again, it seems like this is where the team starts to click; even as this ending story is actually the beginning, narratively it felt like the story thus far was all for the purpose of getting to this point and beyond. I'm assuredly a sucker for the scene where Lois rips open Clark's shirt to find his Superman armor underneath, and Clark slowly taking off his glasses to reveal himself as Superman; Yang also uses a particularly effective callback to Grant Morrison's Action Comics. But it's hard to reconcile this bit with a page later on where the "unmasked" Clark confronts Perry White, and Perry not only lectures Clark on his "lie of a life" but also goes so far as to slap him! I can frankly only hope there's some element of villainy or mind control at play there, because otherwise it would seem Yang doesn't quite get the Perry character, and again that plays to the general sense of uneasiness in the book as a whole. I've rejected the idea of the New 52 characters as being lesser than the pre-Flashpoint characters, believing a lot depends on the alacrity of the writer -- Greg Pak, for instance, writing a competent New 52 Superman. But Yang's New 52 Clark and Lois certainly pale in comparison to the pre-Flashpoint same in Dan Jurgens's Superman: Lois and Clark miniseries, though again I think some of this is by design. Remembering well the last time Clark Kent revealed his identity to Lois Lane, there was never the thought of her revealing his secret to the public (albeit they were engaged at the time); further Lois dismissing the danger and actually revealing the secret seems as implausible as Clark bending to the villain Hordr_Root's blackmail. So there's layers of bad decisions here that don't unfortunately reflect well on the characters, though granted we're only halfway through the story. In this way, again, it's hard to know what to make of Superman Vol. 1: Before Truth. It's poor choices by Clark leading to poor choices by Lois, plus Perry slapping Clark from his hospital bed. I don't mind characters having trouble and I can certainly be patient while Gene Luen Yang wraps up the Hordr_Root arc; I just wonder if the next six issues, connected as they also are to the "Savage Dawn" crossover, will be enough room to tie this all up nicely. I haven't read this yet, but it just seems a baffling editorial choice to hire someone with Yang's profile and then chain him to a crossover event-- why get in a distinctive voice with something to say and then tell him what to say? I saw Yang speak at my university this fall, and my impression was that he only got to do a fraction of what we wanted to do with Superman. Because, yeah, you can't tell me that it was GLY's idea to change Superman's status quo that radically - at least, I'd be very surprised if his first work on a major Big Two title involved outing Clark Kent and no editor batted an eye - though we continuity hounds can relish the fact that this happened while Gordon was taking over the mantle of the Bat under the pen of the only New 52 writer who stayed on from #1 to #52. Put another way, Snyder had earned that clout, whereas GLY's run felt overly mandated by editorial. However, the good news is that "New Super-Man" is proving to be everything I wanted from GLY's Superman. (Indeed, I wonder if it was a kind of apology to give him effective free rein on a title on the periphery of the Rebirth universe.) It's like an in-continuity "Ultimate" title; it's fresh, authentic, unique, and it's doing interesting things with DC's long and strange history of Asian characters. I Ching shows up, and that's not even the farthest back GLY goes. "...it just seems a baffling editorial choice to hire someone with Yang's profile and then chain him to a crossover event..."
On occasion, and I think Picoult is another example, I think comics engages in a type of "stunt casting," bringing a big name on to a book with the intention that it'll only be for a short amount of time, but obviously they can't break the kayfabe and admit it'll only be for a short amount of time. With Yang's run leading into New Super-Man, any of a number of things could've happened; maybe Superman was always supposed to be a short run with the promise of a dedicated series afterward, maybe Savage Dawn was meant to lead more into New Super-Man (isn't there some confusion as to when a key character was introduced) but then Rebirth altered the plans slightly, etc., etc. The whole Truth story line is what made me stop buying comics weekly. Well, not the only thing but it was certainly a huge factor. It was just so badly written with all of the characters acting not like themselves and it just dragged on. It was everything that was wrong with giant cross-overs. It wasn't until I heard really good things about the current Superman and Action Comics run that I decided to give them a try again, and boy am I glad. This is probably the best the various Superman titles have been in years. It helps that DC isn't forcing one big cross-over event on them after another which is what sunk the New 52 Superman titles, IMO anyways. I think the point of Yang's Superman was to challenge every assumption about the character, make him less precious, which is how he tends to be written. But the problem was, I think, that fans violently rejected just *how* far out of the safe zone Yang took him. They took it as a kind of personal attack. Which I suppose is a good thing, because now fans are happy with Superman once again firmly in the safe zone, and Yang is doing a version of the character where his approach seems to fit better. Yang, as far as I can tell, is a writer who's very much interested in confronting culture clash. Superman tends to be depicted as someone who just sort of fits in. That's another reason why the Man of Steel version has been so difficult to swallow, because he's depicted as an outcast there, too. We seem to want Superman to be the ultimate everyman, the guy who is the paragon of virtue, can do no wrong, makes friends with everyone...Y'know, an incredibly believable character. But the dig on Superman is that...he's too unbelievable. So where's the balance? It's really hard to discern how much of this is Yang's; I doubt "Truth" is much of his idea at all, so it's tough to see where Yang's intentions are in any of this book. What little progress I've made in the second sees Yang move Superman out to Oakland to join a fight club; I don't totally agree or disagree with your assessment of all of this, but even for me who tends to have a high tolerance for doing something different with the characters, moving Superman from the East Coast to the West Coast is an awfully big move in terms of just how "East Coast" Superman is -- though I adore his friendship with Haemosu. We can't overlook this all happening against the backdrop of DC You, too. California Dreamin' Superman might've played better without also Batman Jim Gordon and also rock star Black Canary, though equally I'm pretty enamored with what a crazy year DC You turned out to be. I didn't mind the way they took Superman out of his comfort zone, and I was actually excited about this storyline at the beginning. The problem is that it took up 39 chapters over 4 different series, and by the halfway mark I had already grown tired of an outed, increasingly powerless Superman who was on the run and couldn't catch a break. If the team behind "Truth/Savage Dawn" succeeded in anything, it was in making an even more bloated, tiresome crossover than "Doomed". I'm not sure how early on DC decided to kill off this Superman and replace him with the pre-Flashpoint version, but looking back on this storyline, I'm left with the impression that the writers simply decided to mess up his life as much as possible, since they knew they wouldn't have to figure out a way to put the genie back in the bottle afterwards. I'm just done with "Truth," not quite into "Savage Dawn," but I didn't find it laborious so far, at least, surely not as much as "Doomed." Thus far I think Yang, Greg Pak, and Peter Tomasi have done a good job telling four separate but related stories in Superman, Action, Batman/Superman, and Superman/Wonder Woman, which do tie to one another but for the most part don't require one another to be understood, and wow, those Superman/Wonder Woman Tomasi issues are out of sight! Did this part work for you and "Savage Dawn" didn't, or had they already lost you by this point? I'll admit that this crossover had one advantage over the previous ones, which was the fact that each series told its own strand of the overall storyline before they flipped into full crossover mode with "Savage Dawn", but by month six the whole vibe of the storyline started to bring me down. I did think Tomasi's arc was the best of the bunch, but I was annoyed by a certain cheat that I'll comment on when you review SM/WW Vol. 4.